Gentle cleansing for oily skin and hyperseborrheic epidermis.
. ALARGIL Gentle Vegetal Soap is perfect for the gentle cleansing of oily skins and hyperseborrheic epidermises.
. Its formula is enriched with green clay and impurities, and with cedarwood essential oil which absorb and neutralise toxins .
. It leaves the skin clear, fresh, purified, supple and soft. Preserves the skin's natural balance. Lather up the Gentle Vegetal Soap and apply to damp face and body, then rinse in clear water. Can be used morning and night. 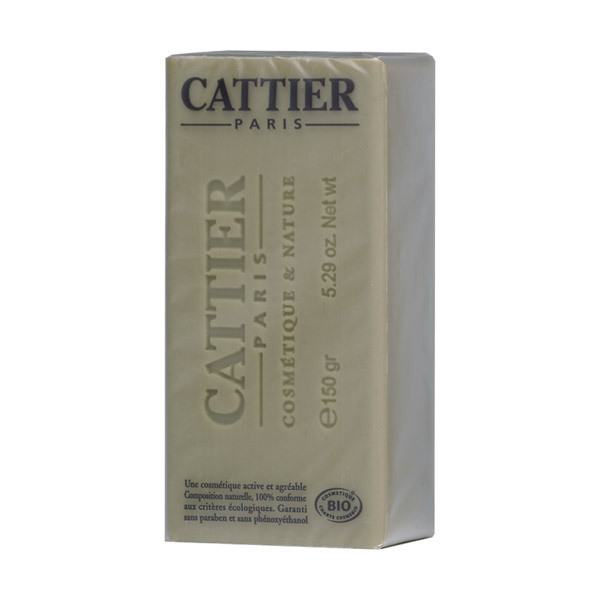 Cattier is a French company of natural and organic cosmetics, created in 1968 by Pierre Cattier. Cattier has always placed its know-how and expertise to promote beauty and wellness through a complete range of eco-friendly cosmetics and hygiene products: organic face care, organic body care, young skin care products, organic baby care products, organic cosmetic kids products, organic perfumes and many more! Cattier cosmetics are natural, gentle, pleasant and effective. They are formulated with natural ingredients partly produced by organic farming methods and do not contain parabens, phenoxyethanol, synthetic colouring or fragrance, or any chemical substances. Cattier is therefore registered as member of the COSMEBIO association. The COSMEBIO label guarantees eco-friendly production methods which excluse the use of pesticides, weed-killers, chemical fertilisers or GMOs.